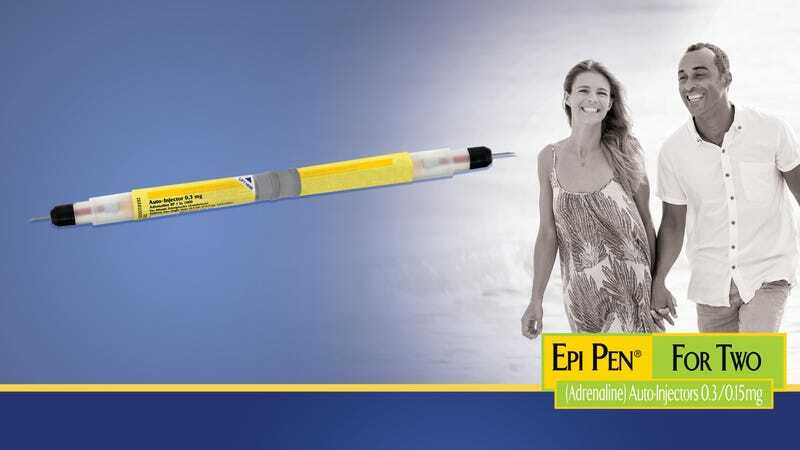 NEW YORK—Marketing the emergency auto-injector as the perfect product for romantic evenings when you and a partner go into anaphylactic shock simultaneously, Pfizer unveiled a new line of double-sided EpiPen devices Wednesday designed exclusively for lovers. “We recognized a real shortage of intimate, life-saving injectables in today’s emergency vasoconstrictor delivery-systems market,” said CEO Ian C. Read, emphasizing that the goal of the new EpiPen-Duo was not only to prevent sudden airway-collapse-based asphyxiation, but also to bring couples closer. “So much of the average allergic episode is spent alone, frantically gasping for air and clawing at your own throat—wouldn’t it be wonderful if couples could simply appreciate each other during those moments? Whether you’re reacting violently during a candlelit shellfish dinner for two or a romantic beekeeping session, rest assured that the double-sided EpiPen-Duo will be there for you when your breathing goes wrong—but the moment feels right.” Read added that the EpiPen-Duo would soon be available at all 650 Spencer’s Gifts locations.